This is the sixth and final instalment recording the recent exhibition of ‘John Sell Cotman: Shelter from the Storm’, held at Leeds Art Gallery, 13 October 2017 to 21 January 2018. Here, we explore the framed works shown in the principal room under the theme of ‘Storm’. Under each caption is a link to a high resolution image of the work and an extended commentary on Cotmania.org, the online catalogue of the Cotman collection at Leeds. Cotman felt more acutely than most the excoriating effects of change. He was born into an age that clung onto an ideal of rural England and died in the triumph of the industrial revolution. His art cleaved to a simpler and purer aesthetic, but was too tender a plant for the tastes of his time. He struggled all his career against financial setback and he fell well short of achieving the kind of artistic life for which he yearned. ‘My views in life are so completely blasted that I sink under the repeated and constant exertion of body and mind. Every effort has been tried, even without the hope of success. Hence the loss of spirits amounting almost to despair. My eldest son, who is following in the same miserable profession as myself, feels the same hopelessness with myself; and his powers, once so promising, are evidently paralysed and his health and spirits gone. My amiable and deserving wife bears her part with fortitude – but the worm is there. My children cannot help but feel the contagion. 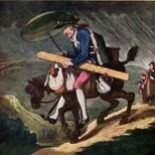 Storm was a popular subject in the early nineteenth century. It supplied a sense of nature for an increasingly urbanised population, but also embodied anxieties about uncontrollable forces of change. This watercolour must have seemed an impressive performance for a young man of nineteen years. After Kitson bought the watercolour of ‘A schooner in a fresh gale and choppy seas’, holding it to the light he could see indications of a signature beneath. When the British Museum removed the drawing from its backing the present drawing was discovered on the support. The design appears to be a self-portrait with Cotman’s face swirling amongst the clouds above a stormy seascape. It may have been intended as an emblem of his destined career. One of the major forces of change in his lifetime was the industrial revolution. Coalbrookdale is popularly regarded as its birthplace, with its coal measures and iron smelting works. Cotman shows a hill-top mine, with a horse gin to power the winding gear, with the profile of The Wrekin in the background. This watercolour was presented by Sir Michael Sadler to mark the completion of his term as Vice Chancellor at the University of Leeds. Cotman visited Welton in September 1803 on a short tour of East Yorkshire. He finished at Wakefield and Cotman made this watercolour for John Smyth of nearby Heath Hall. It is not known if Smyth had any connection with Welton. The windmill was demolished in 1843 but the view across the Humber remains as spectacular as ever. Windmills were an enduring motif for Cotman, symbols of a pre-combustion age technology and relationship with nature. This small watercolour is Cotman’s earliest treatment of this subject, which he visited in 1804. Ruins held a powerful place in the Romantic imagination, speaking wishfully of a simpler but less philistine age. His treatment of the subject culminated in this fine etching published in a series of ‘Miscellaneous Etchings’ in 1811. These were Cotman’s first essays in etching, and this is one of the best of the plates. Cotman visited Llyn Ogwen on his tours of Wales in 1800 and 1802. This watercolour records the view from the south shore to Elidir Fawr and Carnedd y Filiast. After the Normandy project Cotman turned back to sketches from the beginning of his career. In the winter of 1823-4 he set up a new studio in Norwich with the avowed intention of re-establishing his reputation as a poet of nature as well as of architecture. This is a study of the spectacular phenomenon of Parhelion, more commonly called ‘sun dogs’. Some version of the effect is frequently seen, but hardly ever such a complete library of the possible phenomena as here. It may well have been the result of atmospheric disturbance caused by the eruption of Mount Tambora in Indonesia in April 1815. That resulted in one of the most disturbed summers on meteorological record in 1816. Cotman made this drawing to illustrate ‘Excursions through Norfolk’, published in 1819. The viewpoint is close to the present George Hotel at Cley. Blakeney church housed a light to guide ships into the local harbours. The series includes some of Cotman’s most beautifully sparing and austere work. Sadly the engravings fail to properly understand the originals. Worse, Cotman had to importune the publisher to pay him. It remains unclear whether he was ever successful. Cotman visited Domfront in southern Normandy in 1820 and the present subject shows the view from the still-surviving ‘Cent Etages’ that descend from the castle barbican. The outcrop opposite is the Tertre Grisiere, the hamlet that of Les Tanneries, and the footbridge survives to this day. The convulsive geology is noteworthy. Geology more than anything created turmoil in established understandings of the creation and nature of the world. In the 1820s Cotman revived his interest in the sea. He had a boat called ‘Jessie’ and sailed down the Suffolk and Essex coast to the Thames and Medway. The main boat here may be a lifeboat. It would be useful to have short masts in the heavy seas. The watercolour has been attributed to Miles Edmund, Cotman’s eldest son. The quality of the figures and colour are more associable with John Sell Cotman. In 1841 Cotman made an autumn visit to Norfolk. With a lifetime’s poetic store to draw upon, he selected quiet subjects resonant with associations. The old parish chest survives almost unchanged in Blickling Church albeit piled high with hymn books and leaflets. The present subject speaks of old treasures put away; the equivalent of his own life’s store. As it is, Cotman’s death came unexpectedly soon, only eight months later on 24 July 1842. In the 1830s Cotman produced a series of small, highly coloured watercolours of landscape subjects. He drew on subjects from throughout his career, but pared them down to visionary essentials. They have been described as ‘Harbours for the Soul’. The present subject has been called ‘At Whitlingham’, a small village a short way south-east of Norwich. Whether that can be sustained is doubtful, but the composition certain draws on the character of Norfolk heathland. Late in life Cotman produced a series of monochromes which includes some of the most powerful work of his career. In 1838 Cotman exhibited a painting of ‘Scene of the Foot of the Hamilton Hills’. ‘Road to the Hills’ could easily be a recollection the Hambleton Hills of North Yorkshire when in 1803 he travelled in a gig with his Yorkshire patron Teresa Cholmeley to visit Whitestonecliff near Sutton Bank. This is another of Cotman’s ‘Harbours for the Soul’, drawing this time on memories of his visits to North Wales in 1800 and 1802. Cotman achieved his brilliance of colour and handling through mixing pigment with a unique paste medium. He seems to have shown these at private soirees of artists and patrons. Many of the leading watercolourists of the day were present at these, and cannot have failed to appreciate Cotman’s brilliance. A very pleasing resume of the show in the six instalments, of Cotman’s work and of the breadth of the Leeds collection – da iawn! This entry was posted on April 11, 2018 by Professor David Hill in Cotman and tagged Cotman, John Sell Cotman, Leeds Art Gallery.